Even before I start writing, must I here mention that neither am I a right wing supporter nor am I inclined to the left. My religion does not reflect my political ideologies neither do my educational institution. The media landscape which today is full of opinions, it becomes imperative to mention that anything has been posted is devoid of any political influence. So to begin with, I attended the protest screening the controversial documentary, ‘Muzaffarnagar Baaqi Hai’. Calling the documentary ‘controversial’ would probably be the safest as it involves heated difference of opinions. However, if I am asked to define the movie in one word, despite everything or ignoring any consequence, I will use to the word ‘problematic’. 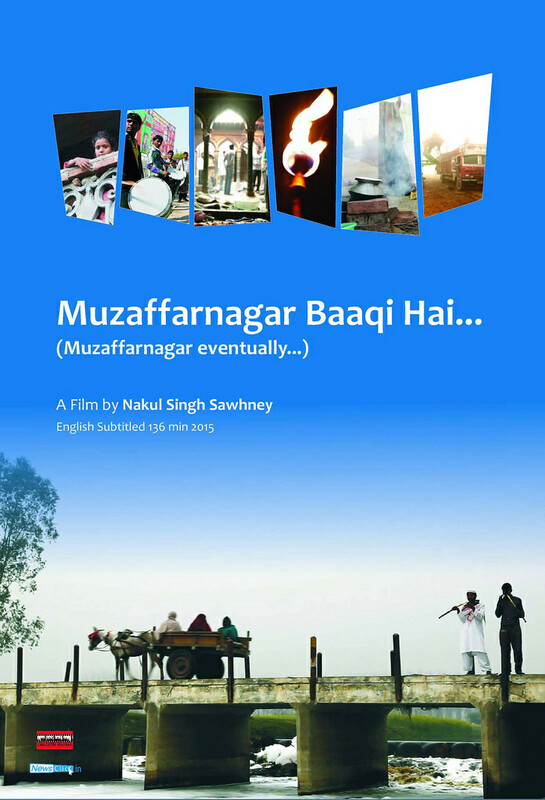 Needless to say, the documentary revolves around the 2013 Muzaffarnagar riots in the Western Uttar Pradesh region and basically narrated stories of Muslim victims, upon whom atrocities were committed by Hindu Jats. Nakul Singh Sawhney, the film maker, provided crude firsthand account of the victims who lost their relatives in the riots. To magnify the impact, he used footage from the riots coupled with fresh visuals of vandalized households and shops. Communal tension was surely brewing in region, particularly considering the fact that Bharatiya Janta Party was trying hard to make a mark in the Western Uttar Pradesh region. Sawhney decided work on the documentary with a primary assumption that BJP’s drive of Hindutva led to this massacre. I am not advocating or criticizing his assumption. Even if what the documentary showed or narrated was correct, as a member of the audience I would have expected a more objective approach to the entire subject. I do respect his opinion, but what I am not comfortable is the fact that throughout the entire documentary he tried imposing his assumption onto the audience. There is absolutely nothing unethical about the filmmaker’s style of documentary filmmaking. It’s perfectly legitimate to make an outright political statement via one’s work. The concern for me here is that nowhere in Sawhney’s work there was an attempt to narrate the alternative side of the story or at least the justification from the other’s end. What demarcates any work from being a propaganda piece is the fact that it accommodates opinions, no matter how contradicting it is. The visuals of the problematic posters on being a Hindu and visuals of communal political meetings all narrated how dirty the game out there is. It has visuals of a candidate delivering a speech, but when he realized the presence of the media, he asked them to move away. Other instances included visuals of Amit Shah, delivering speeches in campaigns organized by caste groups, especially Jats. Interviews of the ‘Modi Sena’ and Vishwa Hindu Parisad members all were indicative of the Right Wing wave that hit the region. Personally I agree with the filmmaker as to what he wants to indicate and he was very outright about it. However, as an audience I was expecting visuals form other side too. As in, one end of the population was polarized, understood; but sure enough the other group also must have been polarized. This comes in from the understanding that the entire episode was called ‘riots’ not ‘killings’. Of course Hindu’s were also killed in the communal violence, what were the forces that acted upon in mobilizing the Muslim crowd? They did talk about the involvement of the Samajwadi Party, but it wasn’t as outright as it showed for the Right wing parties. Also regarding the interview questions, most of them seemed to be conditioned and were filled with assumption. For example, this instance of them asking a VHP member as to what would they do to stop ‘inter-caste marriage’. Now the question was asked assuming the fact that they were against inter-caste marriages, and we all know what they believe in. But just for the sake of objectivity, an initial question should have been about their viewpoint on inter-caste marriages. If they asked and chose to not include it in the final cut, that’s also a part of the larger assumption upon which the documentary was made. Another aspect which I would like to talk about here is about the problematic use of children in the entire documentary. Crude questions were repeatedly asked about who brunt their place and who vandalized their business. It was very evident that these questions were being asked keeping in mind of a particular answer. It must here be considered that children tend to pick words more easily then concepts. So if you are around a place that constantly keeps on talking about one group, it becomes very predictable as to what they would answer. And making them speak the same in front of the camera just reinforces the hatred that is around. Lastly, to conclude, it was really appreciative as to how the documentary depicted the common issues of women. There are issues with the presentation of the same, but I chose not to write about it. The documentary also features a group of the crowd working to restore peace and attempting to re-direct the communal tension to larger issues of the farmers and price issues. They sing songs and go around distributing pamphlets which asked people to talk about issues related to land and agriculture before voting. The political inclinations of these groups were however not at all talked about, and I am sure they aren’t apolitical. There is so much to talk about and write about here. The entire documentary has shot under the pretext of the filmmakers being media personals, read: news personals. But the narrative was a very subjective approach of the entire Muzaffarnagar issue. There is probably a lot that can be said in defence of the points I raised, but we all should understand the Muzaffarnagar is a very sensitive issue. More than political defamation, more than power politics, we must also take into account that there are lives at stake, so we should take care that nothing incites the crowd again. PS: My post has no intension of hurting anyone’s feelings. This is a post from the point of view of an average consumer of news and from someone who is devoid of any political inclination.